Women in the Trades -- now that's fantastic! I wish more women could find out the kind of job opportunities and the wages they can make  often waaay higher than the wages in more traditional jobs. Think Im going to start interviewing some women in the trades to put them on our site! My husband, Dwight, often hires Raylene for work with his Company, D.K. Mechanical  shes a Refrigeration Mechanic. She was over here a while ago to fix our Fridge  shes great! Ill start working on this, right away! If youre a woman in the trades, or you know of a woman in the trades, drop me a line and let us all know how you got there and how you like it -- and how much you make, if you're comfortable with that. I think if more women knew how much money they could make in the Trades, it would become a much better option. Drop me a line through the site at buildyourownhouse@hotmail.com . Hey, we're starting to get some good feed-back from other Women in the Trades! Isn't that great?! there are more and more women in the trades all the time. Great! Can't wait to hear about your up-and-coming Build! Ailsa! And when I was down in Los Angeles in last week (September 2004), I had the great fortune to happen to end up in the Hot Tub at the Hotel at the same time as as a really nice woman, Beth Youhn. We were chatting away, and I was telling her about my Construction Website. She laughed and said, "You'll never guess what I do!" It turned out that Beth is the Executive Director of Tradewomen Inc. -- can you believe that?? So we ended up having a great talk and went out to dinner at one of my favorite Restaurants in Marina Del Ray (The Angler's Choice in The Fisherman's Wharf) with another woman (Madisson from San Fransisco who is a Glazier) who was also in L.A. for their Conference on Women in the Trades. So it turns out that there is an Annual Conference for Women in the Trades -- this year it happened to be in Los Angeles, and I think it's going to be in San Fransisco or San Jose next year. I wanted to add in the Tradeswomen Inc. Website, so if you are interested in pursuing a Career in the Trades (and you're a woman! ), you can click on and check it out. Of course, you don't have to be a woman to click onto their Site -- maybe you know someone who would be interested in a Career in the Trades... you could check it out first and tell them all about it. 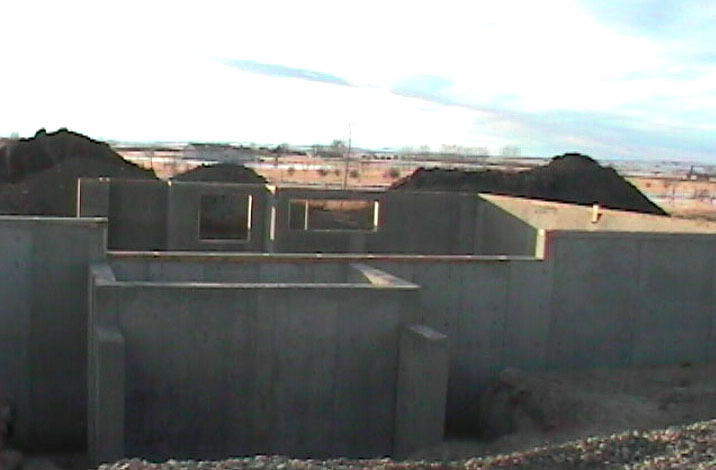 One thing that I thought was fantastic when we were pouring the Foundation for this House was that I saw another woman on the job site (up until then, I was the only one!)  Angela from Burnco Cement. 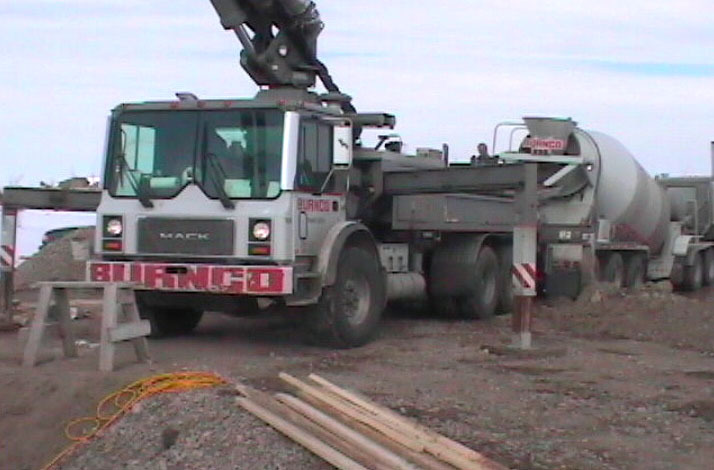 She was one of the Drivers of the Cement Trucks. That's a great job, and I guarantee you she's making a great Wage! 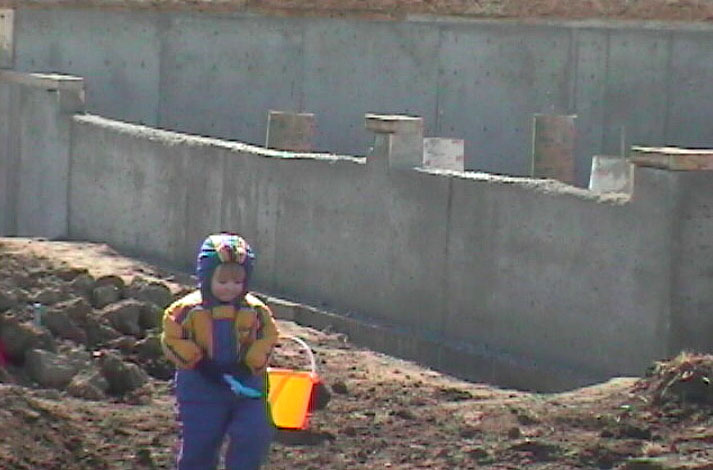 Oh, and that's my son, Aidan, playing around at the Job Site -- he goes everywhere with me, and now he loves building of all sorts -- think he might become an Engineer or a Builder! Great Gifts! ** Cool Freebies! Shopping! *At Home with Ailsa * Tia (The Dog!) * Decorating *Photo Gallery * Webmasters * Full Menu! * Apple Crumble for One (Yum!) *Custom Buffs! * Buy Your Own Home * Sell Your Own Home (not your Neighbors -- they hate that! ha,ha!) *Ask Ailsa * Renovations * Money & Mortgages! * Gambling * Fan Mail! * Home Safety *House Plans * Business & Classified Page * How to Tile * Dealing with Contractors without Going Mad!!ha,ha! * Links * More Links! * Recipes * Tips* Cold Remedy! * Weight Loss Tips! * Apple Crumble Diet * Fitness At Home** Ailsa's Bio *My Favorite Books! * My Lasik Eye Surgery -- it's not gross!! * Annoying Power Bills *** Breast Cancer Stamp ** My Amazon.com Page! * My 'Hook Me Up' Page! * Building Basics * Checklists for Building * Chart for Building -- Keep Track of Your Spending! * Material Checklist! * Building Timeline * Home Improvement Ideas! Recipes -- Cheesecake ,Cinnamon Buns, Salsa Chicken , Macaroni Salad ,Chicken Noodle Soup, Taco Spaghetti , Easy Pie Crust , Creamy Peach Pie , Great BBQ Marinade , 'Pass da' Pasta, Rosemary Steak, Onion Barley (an Aphrodisiac! ), Stuffed Green Peppers, Fruit Puffs , BBQ Veggies, Apple Crumble for One , Barbequed Meatballs, Gambling, Everything Else! !